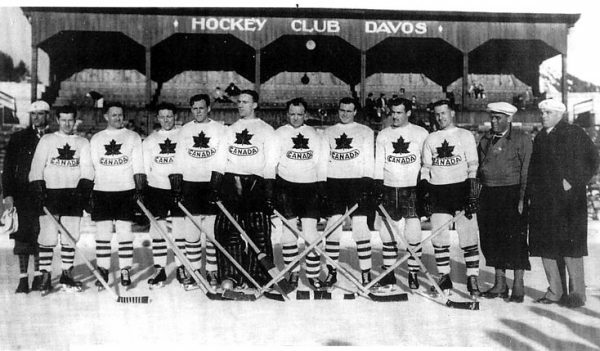 The Winnipeg Monarchs were a senior team that represented Canada at the 1935 World Championship in Davos, Switzerland. Monarchs finished with a record of six wins, no losses and one tie and beat Switzerland in the final. A record fifteen countries competed in the championship.Left to right: CAHA Representative P.K. Reynolds, Tony Lemay, Vic Lindquist, Romeo Rivers, Cam Shewan, Art Rice-Jones, Roy Hinkel, Norm Yellowlees, Archie Creighton, Albert Lemay, a Swiss Referee, Manager Scotty Oliver Missing from photo: Joe Rivers.